Leads were a fantastic new addition to the game; so simple yet so powerful. You could do so many cool and interesting things with this. This idea is just a way to make them even better. The core feature of this idea is the idea of a rope. Ropes are the new base-material for leads and other similar items. Crafted with three string in any straight line, rope is the building block for the rest of the idea. Rope can be placed anywhere as a one block long piece of rope which will extend as long as you have rope in your inventory. This can be stopped using right click and the rope will slither behind you like a snake. Leads have been completely overhauled. No longer are they limited in their length, as long as you have rope in your inventory, the lead will extend. One piece of rope corresponds to two Minecraft meters. If you has 3 pieces of rope and you placed a lead, you would go for 7 blocks, including the lead itself, before you couldn't go further. This fact brings us onto my next point. Ropes, and therefore its subitems, are stronger. No more are they thin, measly bits of cotton thread; ropes are the real deal. Thick and strong! So strong in fact that you can bungee jump off a cliff with them! Ropes are strong enough to pull players around, allowing the aspiring mapmaker to create various games of player fishing, 'tag' and much more. Rope can be used to couple multiple boats, minecarts and mounts together. Simply Shift-Rightclick on any one of the above and then Shift-Rightclick on any other. This will take the required about of rope between the two objects from your inventory. It is best to attach them closely as longer sections of rope can cause violent shaking and banging. This is useful for mule trains, normal trains and boat trains as it allows multiple people to ride to the same place without needed everyone to control it. Controls for horses are still independent however the horse or donkey will follow whichever mount is being ridden. You can override this by jumping on the horse and controlling it separately. Boats act in a similar fashion. You can now create a Stone on a Rope. This is a lead with a 10*10*10 cubic entity attached to the end. Technically, this is simply a new entity which the rope is attached to. This new type of lead is one that is crafted by placing a piece of cobblestone with a rope in a crafting grid. You throw this item to use it with right click. Another possibility is that stones generate randomly in the world on shields and in clusters of varying sizes which one could then use to attach to ropes. This new item has a variety of uses attached to it. We'll talk about the actual stone for now. The stone is a curious entity. It is not a block however it still has a black bounding box around it. The stone cannot be rotated however can be dragged anywhere. The stone makes the mob pulling it go 1/3 the speed they normally are. This makes it a useful mob slowing tool. The stone also enables you to drop anchors from boats to stop them from moving. This is useful for docks when you do not want your boat to drift away. This is made by first dropping the anchor and then Shift-Rightclick on the boat with the rope. This will not put you inside it, instead it will attach the rope onto it. To release the anchor, Shift-Rightclick the boat. The stone can also be used to trigger pressure plates. It can trigger any pressure plate, regardless of its type. Similarly, it can also toggle levers and buttons although this may be hard to do in practice. Stones act like anvils when thrown, taking 0.5 to 4 hearts of damage depending on its speed, height and size*. Stones slide on ice and can be pushed by pistons although this will be slow when on normal ground. Stones also break snow cover, similar to an inverted snow golem. Determines how stretchy the rope is. Default is 5. Determines how strong the rope is. Default is 25. Current rope is 5. Maximum is 255. Determines how big the stone is (by pixel) , as therefore its slowing rate and falling damage. Default is 10. These are other additional ideas which other people have suggested. B. Crafting a stick with flint and then right clicking dirt, sand or gravel. To use a stake, hold a rope and right click the stake. This allows people to define building lots, make art and to guide ropes around obstacles. Stakes could be quite useful and powerful if implemented correctly. Stakes possibly could also be inserted into walls. Pulleys are small, iron 'wheels' which allow ropes to be pulled in an easy way. You craft if by placing iron ingots in a diamond shape with a ghast tear in the middle. The tear symbolises the oil in which helps the pulley run smoothly. You can place a pulley like a lever and it looks like a tall, silver 'ear' with a dark groove around it. To thread a rope through a pulley, you simply right click it whilst holding rope. In some ways, it functions quite similar to a stake however ropes can freely travel through pulleys. Wow you really posted this. Support! One question: How do you pick it up? I suppose you right either Shift Right click or break the rock? The rock should be an entity but you can still 'punch' it off the ground. I'm wondering whether it should get a bounding box or not. Oh and I think it should get a bounding box. Hmm... Interesting idea! I'll add it to the OP. Restructures the Idea, adding more rope ideas to it. Location: In The Mines of Moria! Are you planning to make suggestion? check the search bar first. If a rope is connected to an object (moveable such as a cow or immovable such as a fence), you have the rope item selected in your hotbar, there are more than one pieces of rope to let the rope become longer and you or the object start to move away, it goes slowly because of you letting the rope go a little at a time. If you deselect the rope in your hotbar it will go as fast as it would normaly, untill the length of the rope is reached, at which point you or the object start pulling each other, depending on who is heavier. If you press shift to crouch the rope stops extending, but you can still be pulled, and if you left click and hold you start to reel in the rope. Now if you are heavier that the object you're reeling in towards you, the object will come to you (such as a pig or wolf), but if you are lighter, the object is stuck or a is a block, you pull yourself towards the object (such as a cow, a fence post, a stuck pig). This also works if you are hanging from the rope, meaning you can lower yourself with a rope. This also gives horses a good use and makes cows a bit more difficult to get, as you would need to ride the horse before you can pull the cow (yeeeehaw). Another idea I had, was that if a rope is fastened between two objects (a players and a cow, two fences etc.) you can click on the rope and pull with them. You need an empty hand to do this. You reel in, but without getting a piece of the rope, depending on the direction you're facing. The same mechanics as I described above apply, but the "weight" of the objects are added together. This means that if an object is unmovable or heavier than you, you still pull yourself towards it. This could make for teams of people to pull a cow, or stationary ropes across chasms or up a hole. And if your idea of ropes without harnesses hurting mobs works on people, you could hang someone (which is not something I'd support, frankly, but I thought of it and it might be good if you put a disclaimer saying you cannot hang people or something). Well, hanging is a fact of life. You cannot escape it. You probably just cannot die, just get to half heart. However, I like you ideas. Well, no. You can stretch it though but unless it snaps, no you can't go through it. Why would you want to? If there's any way I can use it like Tarzan can, then HELL YEAH! I hate people who complain. I hate spiders. I hate people who own an Xbox One. I hate people who like sandbox games. I hate people who like first person shooters. I hate people who like explosions. I hate people who like video games. I hate people who are hateful. I hate people that don't like spam. I hate people who like cake. I hate people who type in proper grammar and spell words properly on the internet. I hate hypocrites. Its nice, but its a bit overpowered... but because u need to kill spider to get it, it fixes it. I wouldn't really say it's overpowered, I mean moving mobs around is already possible with fishing rods. 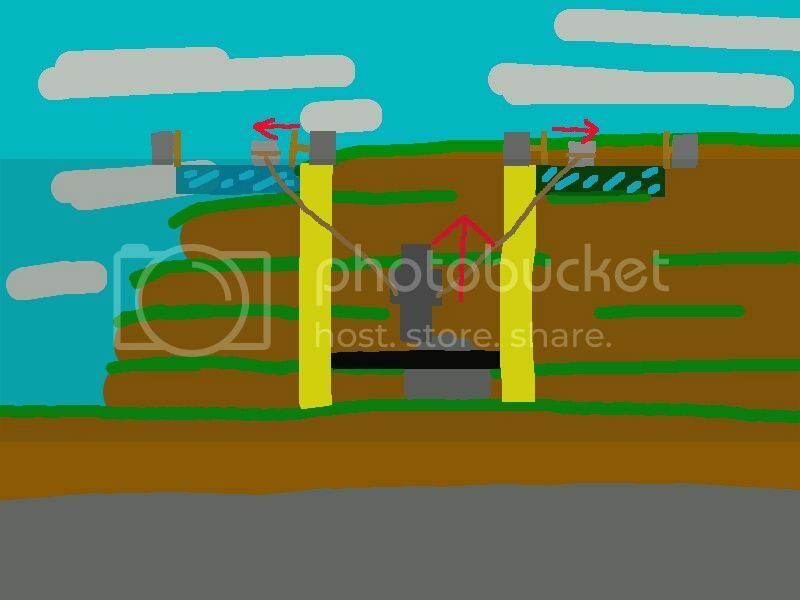 Is there any way to attach one side to a pole on one side of a cliff and another side to the other pole on opposite side of the cliff and use it as a hanging bridge? I think it could be nice, huh? Support, your thread go's in a lot more in depth than mine, and I think this would be an awesome addition to the game. Does the stone lock itself in place, or does it get pulled along if you put your back into it? And can we get a grapple hook if that's the case? Is there a way to "reel" line? A way to add and remove rope to the line you're tied to, so you can rappel down? And can we have different kinds of rope? I'm thinking rope like the above for when you need give in the line, and chain for when you want heavy, no-holds-bared hauling action. I support, it's a neat and wonderful suggestion. Im a master of ideas. And puns. I had one or tow more ideas that may work. You could craft "stakes", which you put on the side, the top or the bottom of a block. They would be a stick with ring on one end and you stick the other end "into" the block. You can attach a rope or a lead to it. To remove the rope, you could right click on it, which doesn't break it but simply lets you hold it. It would give one stake arrow. To fire it, you need to have rope in your inventory. You then select the stake arrow and left click while holding it. The item now shows that a rope is attached to it. When you next fire an arrow, it will be a stake arrow. Behind it, it trails the rope, which is extending from your inventory. If the rope runs out before the arrow hits something, the arrow turns into an entity, like the rock on a lead, but very light. This means you can drag the arrow back, and it pops into your inventory as soon as you touch it. If the arrow hits a block however, a stake is planted there that is attacked to the rope, giving you a sort of grappling hook. To remove it you would need to go to the stake and remove the rope or destroy the stake. I don't know what should happen if the arrow hits a mob or a player. I mean, it could be cool to reel in monsters like that, but it seems to me to be too OP. It should probably just damage the mob and break the rope.